A fear of intellectual inadequacy, of powerlessness before the tireless electronic wizards, has given rise to dozens of science-fiction fantasies of computer takeovers. ... Other scientists too are apprehensive. D. Raj Reddy, a computer scientist at Pittsburgh’s Carnegie-Mellon University, fears that universally available microcomputers could turn into formidable weapons. Among other things, says Reddy, sophisticated computers in the wrong hands could begin subverting a society by tampering with people’s relationships with their own computers—instructing the other computers to cut off telephone, bank and other services, for example. An early prediction of DDoS (Distributed Denial of Service), viruses and worms like Stuxnet. As stated, without further citation, in 'The Age of Miracle Chips', Time (20 Feb 1978), 44. The article introduces a special section on 'The Computer Society.' Please contact Webmaster if you know a primary source. Aimed by us are futuristic humane machines wherein human level electronic intelligence and nerve system are combined to machines of ultraprecision capabilities. In Marc J. Madou, Fundamentals of Microfabrication: the Science of Miniaturization (2nd ed., 2002), 467. Dr. Bhabha was a visionary. He had excellent command over electronics, physics and he saw the dream of India being a nuclear power. … He was a perfectionist and would leave no point of suspicion while working on any project. He was an inspiration. Interview in newsletter of the Raja Ramanna Centre for Advanced Technology (Oct 2001), online. Electronic calculators can solve problems which the man who made them cannot solve but no government-subsidized commission of engineers and physicists could create a worm. In 'March', The Twelve Seasons: A Perpetual Calendar for the Country (1949), 184. I would like to start by emphasizing the importance of surfaces. It is at a surface where many of our most interesting and useful phenomena occur. We live for example on the surface of a planet. It is at a surface where the catalysis of chemical reactions occur. It is essentially at a surface of a plant that sunlight is converted to a sugar. In electronics, most if not all active circuit elements involve non-equilibrium phenomena occurring at surfaces. Much of biology is concerned with reactions at a surface. 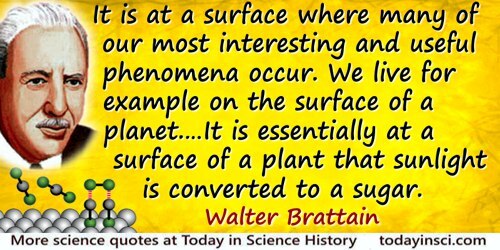 'Surface properties of semiconductors', Nobel Lecture (11 Dec 1956). In Nobel Lectures, Physics 1942-1962 (1967), 377. The progress of Science is generally regarded as a kind of clean, rational advance along a straight ascending line; in fact it has followed a zig-zag course, at times almost more bewildering than the evolution of political thought. The history of cosmic theories, in particular, may without exaggeration be called a history of collective obsessions and controlled schizophrenias; and the manner in which some of the most important individual discoveries were arrived at reminds one more of a sleepwalker’s performance than an electronic brain’s. From 'Preface', in The Sleepwalkers: A History of Man’s Changing Vision of the Universe (1959), 15. The thing about electronic games is that they are basically repetitive. After a while, the children get bored. They need something different. [Meccano construction toy kits] offer creativity, a notion of mechanics, discovery of the world around you. As quoted in by Hugh Schofield in web article 'Meccano Revives French Production' (23 Dec 2010).